According to the US Bureau of Labor Statistics, employment of health information and medical records technicians is expected to increase 20% by 2018, a much faster rate than the average for all other occupations. To accommodate this surge in HIT jobs, universities are creating both traditional and online programs featuring cutting-edge curriculums aimed at graduating qualified professionals with hands-on experience. The program provides students with experience in cloud-based systems, which Bhansali says are on the cutting edge of HIT. “We partner with CareCloud [a technology vendor] to allow students to learn what cloud-based solutions are and also to bring in industry experts as guest speakers so students can learn what is current in the industry,” she says. To ensure that the curriculum stays relevant, FIU offers special topics courses that change according to industry trends. For example, mobile technology and public health informatics currently are being offered. “As the industry evolves, we can change the courses, keeping the curriculum flexible to ensure students are learning what is most pertinent,” Bhansali says, adding that establishing strong industry partnerships enhances the university’s ability to bring such a strategy to fruition. FIU features courses in leadership, management, and quality assessment. It also builds students’ presentation skills in an effort to produce graduates who can lead multidisciplinary teams throughout a health system. The 12-month program requires a practicum of 75 to 100 hours to give students the opportunity to apply the theories and concepts learned in the classroom in a real-world setting. The health information management and technology program at the University of Wisconsin (UW) features a collaborative online curriculum in which faculty from four different campuses teach health care, HIT, finance, and systems analysis in a university framework. Program director Frank Waterstraat, PhD, RHIA, MBA, says students are taught how to manage health information and perform EHR-related project management. While UW offers core courses similar to those in a traditional HIM degree program, including medical terminology and coding and reimbursement, it also boasts tracks in system design and implementation, project management, and health care data and standards. “We want to help students to learn to understand current IT processes and to solve the emerging HIT problems they will encounter,” Waterstraat says. The program has seen enrollment triple in the two semesters it has been in place. Moving forward, there are plans to create an advisory board featuring health information experts from nontraditional roles such as health insurance, long term care, and public health. This will create a clearer picture of future job requirements and account for the possible emergence of new HIM technologies in a few years. Having a nontraditional online classroom benefits adult students, Waterstraat says, adding that a virtual program develops work skills that can’t be obtained in a typical classroom setting. For example, learning how best to manage time can help students down the road whether they work on site or in a virtual environment. Besides educating those interested solely in an HIT career, it also is important to train medical school students in the art of using the myriad applications they almost certainly will encounter on a daily basis once they graduate. Brent Orndorff, an HIT specialist at the Indiana University School of Medicine in Terre Haute, says universities need to incorporate HIT into medical school curriculum. According to Orndorff, medical school students spend most of their time mastering clinical information with minimal exposure to HIT until their first floor rotations or residency experiences. 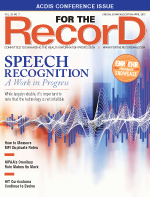 “Not a lot of introduction to EMRs or privacy and security requirements, which are critical to know before heading into practice, is found in typical medical school curriculum,” he says. In response to the growing demand for HIT jobs, the School of Informatics at Indiana University-Purdue University Indianapolis (IUPUI) offers graduate certification programs in HIT. “With the Indiana Health Information Exchange being one of the leaders in the country, IUPUI is one of a handful of universities that received a grant to offer this type of program,” Orndorff says. The skills needed for graduates to obtain that elusive first job tend to vary by region, according to Orndorff. IUPUI’s graduate programs have the benefit of tapping into regional resources and partnerships to help place graduate students into meaningful internships, he notes, adding that most graduates of the 12-month program have been able to land an HIT position on graduation, with the biggest roadblocks being location hurdles and family obligations.